When thinking about ecohomes and sustainable housing, it’s tempting to imagine fancy architect-designed new builds, the kind of wood and glass edifices featured on Grand Designs. But of course most of us live in something more modest than that. We can’t afford to knock down half the houses in the country and rebuild them, it’s important to look at retrofitting too. This week I wanted to highlight a scheme in Moss Side. It’s a pretty famously run-down part of Manchester, mostly streets of terraced Victorian houses, and recently re-generated by Manchester City Council. Victorian terraces are usually well-built, and the streets sensibly planned, so there’s no reason to demolish them. 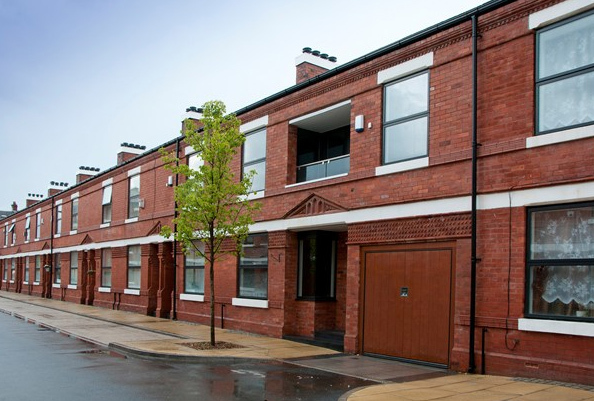 Instead, the council completely refurbished them to code 4 standard – not zero carbon, but a massive improvement. The front walls were insulated with internal cladding to keep the exterior appearance, while the back walls were generously insulated with external cladding. Front doors,windows and roofs were replaced. Solar panels were fitted on the roof and sunpipes bring natural light down into previously dingy stairs and landings. Streets were made one-way, pavements widened and trees planted. In all, 155 terraced houses were reworked around Bowes Street, some of them knocked through to make larger family homes. The result is a development that respects the sense of place, but lifts the housing stock into the 21st century. They look very smart, but its not just the technology, but how you use the building as well. Lets hope those who move in get energy efficiency advice. That’s true, although they come with new boilers and fitted appliances, so people get a headstart. The main advantage is that Victorian terraces are the last time we designed housing for compact city living, before the car and the suburbs boomed. Terraced streets are usually well planned with shops interspersed, with work, public transport and parks all within walking distance. If you can open them up inside and create better outside space out the back, they can be very desirable and convenient places to live. This is such an excellent way of giving a new lease of life to Victorian terraces. I live in an area of Leicester with lots of these terraces – in fact I live in one – and would love something like this to happen here.